Veterans: Are You Missing Out On Key Benefits? (BPT) - There are currently 19.6 million veterans in the United States. These hard working men and women have access to a variety of programs and benefits through the U.S. Department of Veterans Affairs during active duty and retirement - yet many are not taking full advantage. Why? One reason is that the VA system can be difficult to navigate. That’s where the Military Order of the Purple Heart National Service Officers can help. NSOs are accredited veteran representatives located at VA regional offices, medical centers or clinics, and military bases throughout the country. Guidance from these experts can make all the difference for veterans of all ages. In 2014, National Service Officers helped over 19,000 veterans get over 300 million dollars in lifetime benefits from the VA. Ripe says a main piece of her job is making veterans comfortable so they can start talking about their experiences. “We talk and figure out what’s going on. Often they don’t think of certain things or don’t realize issues they may be having are combat related, such as tinnitus,” she says. While veterans can file claims on their own, Ripe doesn’t recommend it. NSOs are experts who not only have ongoing training in the legislation, regulations and precedents, they have relationships within the veteran community they can leverage. “If I get a really tough case, I can go to appeals at the VA and ask how to put it in, and they will help me, because wording is very important,” Sandra says. Her primary goal is to put the fully developed claim in correctly the first time with all the proper documentation and evidence to back it up. If submitted incorrectly and a claim has to go into the appeals system, it can take 2-3 years to be resolved opposed to the 4.5 month average a first-time claim takes to make its way through the system. Another function of the program is the National Appeals Office in Washington D.C., where expert professional representation is provided to veterans whose claims have been denied at the regional office. This program is one of the few Veteran Service Organizations eligible to take selected cases to the Court of Appeals for Veterans Claims. This Veterans Day, celebrate the service men and women in your life by ensuring they are getting the benefits they deserve. 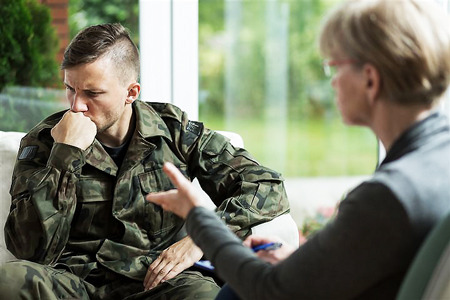 NSOs are available to be advisors and confidants to veterans who struggle to speak openly to friends and family about their time in the service as well as current struggles. They help veterans get the care they need and the benefits they deserve. Consider making a tax-deductible, nonprofit donation to the Purple Heart Foundation to help support this important program. Visit www.purpleheartfoundation.org to find out how easy it is to help.